Can we take a peek at your bucket list? Sandyport Beach Resort's concierge, Lady Sarah, stands ready to turn that list into a lifetime of treasured memories. She'll share local insights, customize an island itinerary, and still make time for a little sip sip. 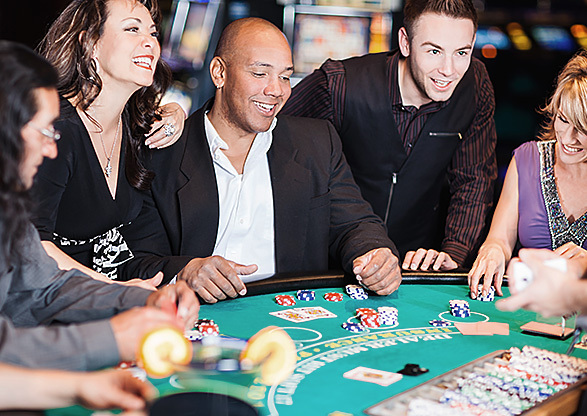 Whether you'd like to try shark diving, swim with dolphins, shop the Straw Market, or beat the odds at a Vegas-style casino, you (and your bucket list) are in the Bahamas' best hands. Best of all, most activities include transportation from the resort. Always wanted to take a swim with a dolphin? Now is your chance. Several attractions in and around Nassau offer face-to-fin encounters with these beloved creatures. Dolphin Encounters on Private Blue Lagoon Island - Owned and operated by locals, Dolphin Encounters is the oldest dolphin facility in Nassau. Offering award-winning education and entertaining dolphin and sea lion interactive programs and a full range of experiences from encounters to swims to trainers for the day in their all-natural ocean habitat. Add on a Blue Lagoon Beach Day package and you can make the fun last all day. There is an experience for all age groups. Includes transportation from the resort and scenic boat trip to Blue Lagoon Island. Atlantis Bahamas Dolphin Cay - Located in the heart of Atlantis, this 14-acre facility is a cutting-edge marine habitat and animal rehab facility, offering a wide range of interactions. If you have a limited amount of time, Atlantis’s location is more convenient and the experience can be incorporated into other experiences at Atlantis like visiting the Dig or the waterpark. Stuart Cove’s Dive Center is our go-to source for exploring the spectacular world below our crystal-clear water’s surface where beautiful walls, reefs, wrecks and movie sites are teeming with the marine life of the Bahamas. Transportation included! Shark diving trips - Calling all thrill-seekers. Stuart Cove’s 2-tank shark dives provide an up-close encounter with wild sharks, including a shark feeding time dive. There are currently four sites where we dive with the sharks. You will dive either the combination of "Shark Wall" and "The Arena" or the combination of "Runway Wall" and "The Runway". At either location encounter a gathering of Caribbean Reef Sharks on a consistent basis. Discover Scuba Diving – Certified Stuart Cove Scuba Diving Instructor’s teach you basic scuba skills in the resort pool and then take you on your first ocean dive. Snorkeling excursions – Half-day snorkeling trips that's fun for the whole family. Featuring multiple stops at shallow reefs or shipwrecks, including Nari Nari, Little Elvis and Goulding Cay. Snuba trips – It’s not snorkeling! It’s not Scuba! Fun for the whole family, no lesson required or certification required! Stuart Cove's offers twice-daily SNUBA trips along a shallow coral reef or wreck with a certified instructor. Bubble Sub – Pilot your own submarine around the beautiful reefs with colorful fish swimming along with you. No snorkeling or diving experience necessary. 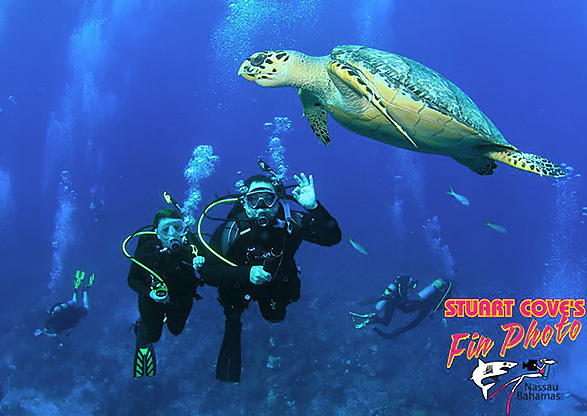 Scuba Certification – stay with us and get PADI certified through Stuart Cove’s. Day Trips – We also offer excellent half and full day trips that include snorkeling. Complimentary Snorkeling Gear – available from the Front Desk for exploring that water right off our own beach. Relax and restore with Suzanne Fraser’s Total Tranquility massages and spa packages. Available surrounded by the ocean in our ocean gazebo, in your villa, by the pool or at The Lookout. 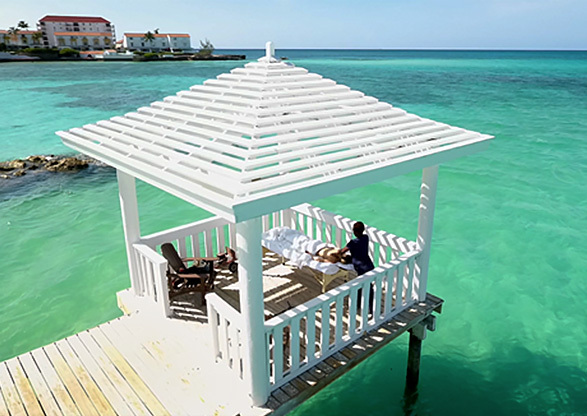 Massages can be arranged in the Ocean Gazebo, at The Lookout overlooking the ocean, by the pool, or in the privacy of your guest room or suite. 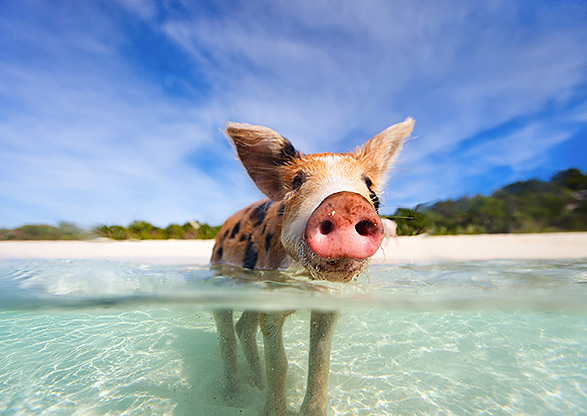 Enjoy a full day adventure with Harbour Safaris like no other - feed and play with the legendary Bahamian Swimming Pigs! Travel through the Northern Exuma chain all the way down to Big Majors Cay, home of the swimming pigs. Take a once in a lifetime trip to the Exuma Land and Sea park to feed iguanas, sharks and stingrays or walk along an isolated sand bar. Stroll along a 3 ½ mile pink sand beach on Habour Island or take a scenic boat ride to a private island and enjoy snorkeling on beautiful coral reefs. Powerboat Adventures – an unforgettable once in a lifetime full day experience by high speed boat to the Exuma Land and Sea Park where you will feed Iguanas, Stingrays and sharks and experience amazing snorkeling. The reviews for this trip are exceptional – check out TripAdvisor. You definitely want to book this one ahead of time if you are coming in high season. Blue Lagoon Beach Day – Spend the day relaxing on this private island just off New Providence. Say hello to the dolphins, relax in the hammocks, play in the inflatable water park and enjoy non-motorized water equipment. Sandy Toes Rose Island Getaway – Take a day trip to the uninhabited Rose Island for a relaxing day drinking daiquiri while lazing in a hammock and snorkel on their coral reefs. Seahorse Catamaran Sailing Adventures – cruise on a beautiful catamaran sail boat for either morning or afternoon trips with snorkeling or enjoy a leisurely sunset dinner cruise through the harbour on Wednesdays and Saturdays. 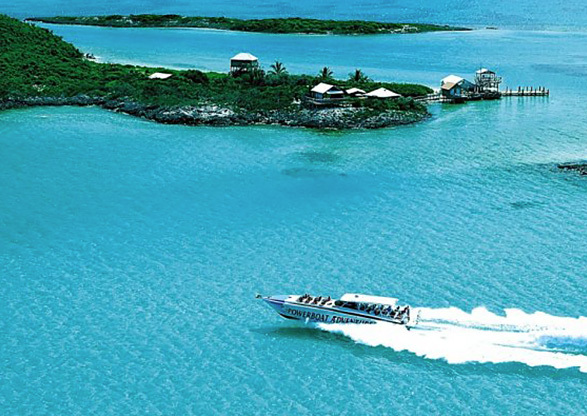 Island World Adventures – Another once in a lifetime full day experience by high speed boat to the Exuma Land and Sea Park. Where this trip differs from Powerboat Adventures is that you visit an isolated sand bar which is high up on many guests’ bucket lists. Day trip to Harbour Island – Harbour Island “Briland” just off Eleuthera is famous for its 3 ½ mile pink sand beach and quaint village of colorful island cottages. Bahamas Fast Ferries offers packages that include resort pick up and return high-speed ferry service to Harbour Island inclusive of golf cart use. Seaworld Explorer – offers an exciting adventure into the underwater world without getting wet in their semi submarine. Cruise through Nassau Harbour exploring the sea gardens marine park teeming with sea life. Please note this activity is located in the downtown area and does not include resort pick up but is easily accessible by the #10 bus. Private Boat Charters – There are a number of charter and self-drive options available to our guests. Please contact with you details and we can help match you with the perfect boat and operator. The Bahamian Waters are renowned for their many species of big game fish. 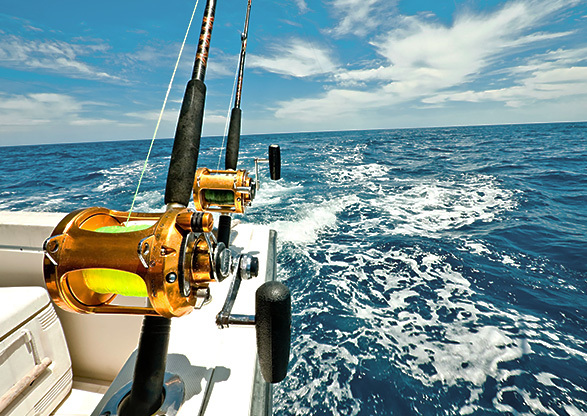 Whether you’re a first-timer or a deep-sea fanatic we can connect you with the right Deep Sea Fishing charter for you. Make sure to book a suite as your full kitchen will be the perfect place to cook your catch of the day! Discover Atlantis for the day in The Aquaventure Water Park and return to your tranquility at Sandyport. Atlantis packages can be purchased in advance including resort pick up and lunch or at the Atlantis tour desk at the Atlantis Hotel. Subject to availability. Discover Atlantis Tour – tour includes the Atlantis aquarium, The Dig. Atlantis Beach Day/ Discover Atlantis Tour – tour includes a tour of the Atlantis Aquarium, The Dig, and an all – day access to the Atlantis Beach. It does not include the Water park. Aquaventure Water Park – Discover a 141-acre world of water features including slides, river rides and 20 million gallons of excitement. Plummet down the Leap of Faith, race your friends on twin challenger slides, or grab an inner tube and enjoy the twists and turns of The Surge. 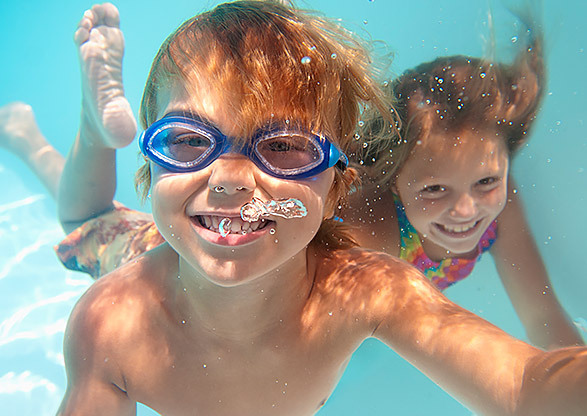 This package includes access to the marine habitats, beaches, pools, slides and rides of Atlantis. For partygoers, Nassau kicks it up a notch after dark with a stellar selection of entertainment, live music, nightclubs and casinos. The largest Casino in the Caribbean in just down the road from us at Baha Mar. sure to catch the Fountain show, and the latest act playing in the piano bar. at the upscale Aura nightclub that attracts a celebrity crowd. Fluid, is all about the latest reggae jams. 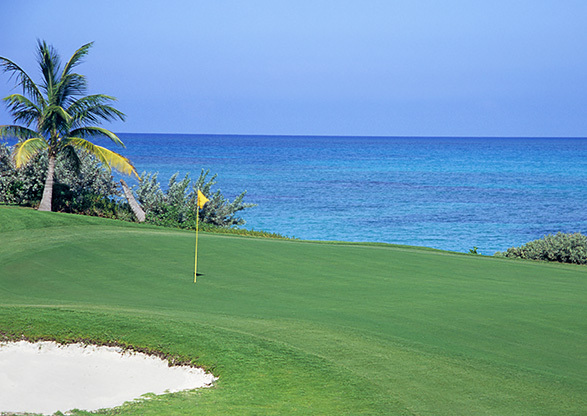 Beautiful Ocean views and an island green create the perfect backdrop to award winning Golf Courses in Nassau or ask us about island golf course hopping to take advantage of all the Bahamas has to offer. The Royal Blue at Baha Mar - Designed by the Golden Bear this Jack Nicholas Signature Course features a challenging island green and elevations that take advantage of the local landscape and tropical native landscaping. Located minutes from the resort. Ocean Club Golf Course - An award-winning, championship, Tom Weiskopf designed golf course featuring magnificent ocean and beach signature holes (don’t miss #4 and #17) that bring a whole new meaning to the Bahamian Bunker shot. Host of the Pure Silk Bahamas LPGA Classic. Day Trips to the out-island courses - Ask us about Day Trips to Winding Bay, Treasure Cay, Grand Bahama, and Emerald Bay. Conch salad with a Kalik, fine dining in a historical mansion, burgers while watching the game, freshly picked mangoes: the variety of culinary adventures offer something for all tastes, budgets, and occasions. Our concierge team can assist with making reservations at our Sandyport restaurants and throughout the island. Conch - Served fried, cracked, in salad and savory chowder, conch is synonymous with the Bahamas. Catch of the Day - Reel in your dinner aboard a fishing charter with a local captain. Cook it in your in-suite kitchen or have the chef prepare it and serve it poolside. Local Brews - Kalik or Sands? Sip and decide which local brew you like best. John Watling’s Distillery - Take a tour of this historic Buena Vista rum-making estate and sample award-winning rums distilled from freshly pressed sugar cane molasses. It’s off to the trails, leading through the woods and onto a beautiful unspoiled beaches of Coral Harbour and Adelaide, a nearby village and alongside the natural lake of Corrie Sound. The pace is leisurely and no special experience is necessary to enjoy a wonderful horseback ride! Follow in the footsteps of pirates, rum-runners and artists as you explore the culture, history and heritage of our island paradise. City and Country Tour - Drive through old romantic Nassau and environs to see ancient Fort Charlotte, Gregory’s Arch, Legislative buildings, Law courts, straw market and many other historic sites in the centuries old capital of The Bahamas. Tour conducted by Majestic licensed guides. Pick up from the resort included. Local Culture Tour - Explore the unique aspects of Bahamian Culture. Visit a local “Down Home” Junkanoo shack to see how the beautiful costumes and music of The Bahamas most deeply rooted cultural festival comes to life. Indulge in some treats at a local chocolate factory, visit our National Art Gallery, and a local Distillery to sample a taste of fine Bahamian Rum. Tour conducted by Majestic licensed guides. Pick up from the resort included. 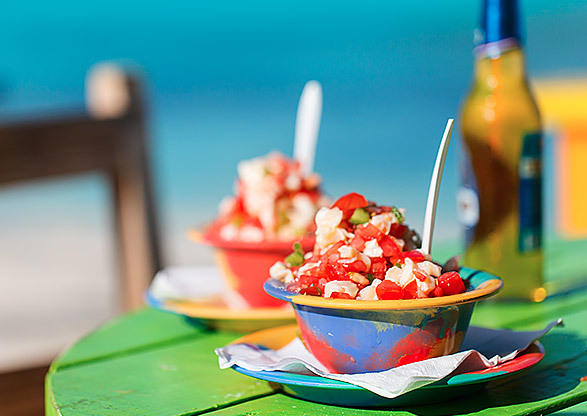 Bites of Nassau Food Tasting & Cultural Walking Tour - Experience a unique and authentic culinary and cultural adventure through the heart of historic Old Nassau with food and drink tastings at a number of local restaurants and shops. People to People - Bahamians love meeting new people and making friends. When you join The Bahamas Ministry of Tourism’s complimentary People-To- People Experience, you’ll be paired with a Bahamian ambassador who will show you our culture and way of life. Find out more here. 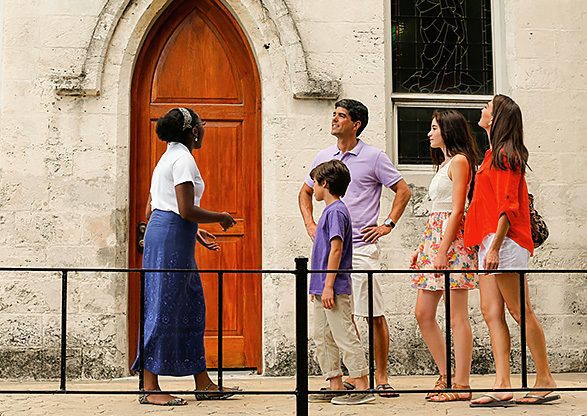 Tour Nassau at your own pace - Don’t forget to save our Island Map to be your guide to these top historical and local attractions. 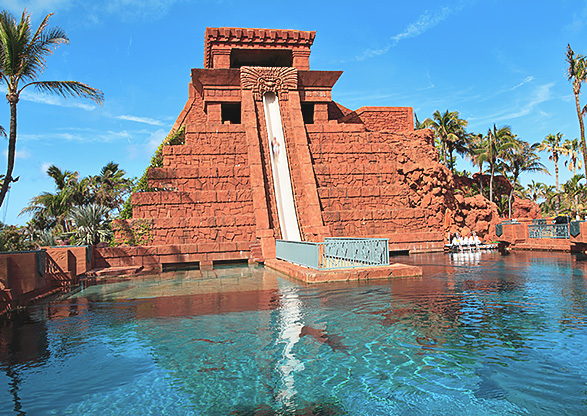 If you can manage to pull the kids away for the resort’s waterslides there is much to explore in Nassau for Kids. Get a kiss from a dolphin, march with Flamingos, splash at the water-park, make your own chocolates or play pretend with Pirates. Aquaventure Water Park – Spanning 141 acres, Aquaventure at Atlantis is the largest water park in the Caribbean and offers endless thrills for the whole family. Dolphin Encounters – Kids love getting a kiss and hug from a dolphin. Choose between the dolphin encounter or a swim. 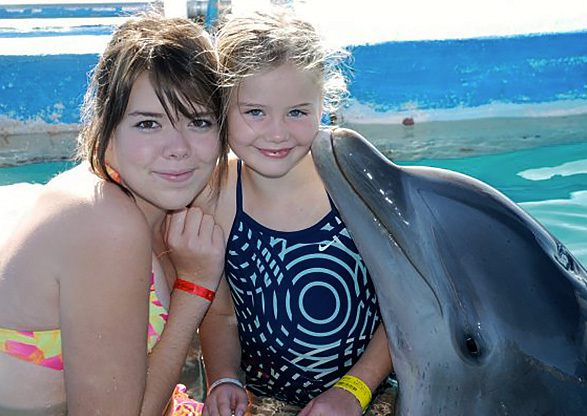 Dolphin Encounters are open to children of all ages while you must be 6 or older for the swim. Children 12 and under must be accompanied by a paying adult. Ardastra Gardens, Zoo and Conservation Center - Kids will love The Ardastra Gardens, Zoo & Conservation Centre for all of its interaction opportunities with the animals. 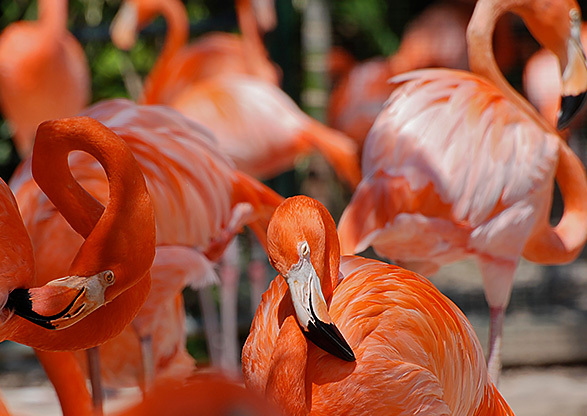 Don’t miss the "Flamingo Experience", a unique show of the glory and antics of the Bahamas National Bird. The kids will be having so much fun they won’t realize they are getting an education at the same time. Graycliff Chocolatier Factory - Kids and chocolate… this is sure to be a winner. A perfect educational experience for the entire family. Enter the world of chocolate and learn about the chocolate-making process from bean to bar. Stuart Cove - Snorkeling is a great activity for the whole family (4 and up) with Stuart Cove’s Dive Bahamas and for a truly unique experience try SNUBA. "Big Picture" - Paint your own creations at the Art Studio in the Sandyport Marina Village. - Step it up a notch for teenagers with Trainer for the Day packages – Dolphins, Sea Lions and Sting Rays. - Enjoy the thrill of piloting your own bubble sub or try your hand at scuba diving. The Bahamas is a destination of extraordinary natural beauty where you can meet the magnificent Caribbean Flamingos or learn about bush medicines while exploring the lush landscapes to crystal-clear waters. Join a nature tour with Bahamas Outdoors or visit some of our national parks at your own pace. Pack a picnic lunch and discover the natural wonders of our island oasis. Ardastra Gardens, Zoo and Conservation Centre - a boutique zoo spread over 4 acres of lush tropical gardens. Ardastra is home to many native species of plants and animals - including the Bahamas National Bird, the beautiful and exotic Caribbean Flamingo. Don’t miss the "Flamingo Experience", a unique show of the glory and antics of these incredible creatures. Seaworld Explorer – offers an exciting adventure into the underwater world without getting wet in their semi submarine. Cruise through Nassau Harbour exploring the sea gardens marine park teeming with sea life. For those wanting to get up close and personal have a look at Diving and Snorkeling opportunities. Nature Tour with Bahamas Outdoors - This custom designed tour is probably the best way to explore the islands nature reserves with the expertise of a certified Ecotour guide. Learn about the birds, butterflies, flowers, native flora, bush medicine and the different ecosystems. Visit some of the nature reserves on New Providence including: The Retreat Gardens, Harrold & Wilson Ponds National Park (fresh water), Bonefish Ponds National Park (salt water), The Primeval Forest, Clifton Heritage National Park and the Botanical Gardens This is a comfortable 4-hour tour by vehicle with some gentle walking according to your desire or ability. Fun for the whole family. Off- Road Biking Tour with Bahamas Outdoors – Bike on easy trails through the forest, along the seashore to visit historic Adelaide Village and enjoy the wildlife. Half Day about 10 miles. Full day includes visit to Clifton Heritage National Park, Picnic lunch and swim About 20 miles. Power boat adventures, Swimming Pigs, Ride a Horse on the Beach, Swim with Dolphins. Tour Our National Parks at your own pace - Don’t forget to save our Island Map to be your guide. - Clifton Heritage National Park - Outdoor trails and indoor exhibits preserve the history and culture of the Lucayans, Loyalists and Africans. PAINT. SIP. MINGLE. and HAVE FUN! Join a paint party at Big Picture Paint and Sip Studio in the Sandyport Marina Village and take home your own island masterpiece as a souvenir. 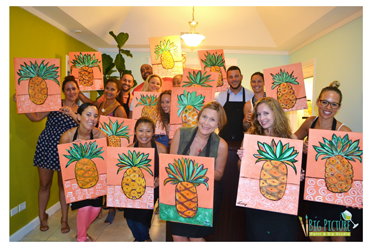 Add a splash of creativity and fun to your next visit to the Bahamas with Big Picture Paint & Sip Studio in Sandyport. This unique experience brings the fun to Art with no painting experience required. Trained artists guide you step by step through the process while you sip wine and mingle. Once completed you get to take home the masterpiece that you created. Upcoming paint parties include; Luxe Hibiscus, Tropical Pineapple, True Blue Hole, Green Turtle and Stingray life which make ideal souvenirs of your time in the Bahamas. The paint parties are a popular spot with locals and a great opportunity to connect with the local community. After a two hour guided painting experience and a few glasses of wine later, in a light-hearted environment, you are likely to make a few friends while having an unforgettable night! For the information on the paint parties during your stay please visit: https://www.bigpicltd.com/index.php/eventcalendar/month.calendar . Make sure to register to confirm your space as the popular activity can book up in advance. Each booking includes the cost of the canvas that you take home, plus the use of all paint materials and supplies. Wine is served complimentary with the painting experience making this not suitable for those under 18. However, they have a ‘Little Picture’ program designed to accommodate school aged kids with daytime sessions each Saturday. For more information please visit their website https://www.bigpicltd.com/ or contact our concierge team who have all the insider’s information. They are located at #8 South Buckner Square, Sandyport Olde Towne. Souvenir shopping reaches new heights in Nassau. Whether you’re strolling Bay Street or scouring the world-famous Straw Market, you’ll find countless take-home treasures. Bay Street – Nassau’s main street is lined with gift shops, jewelry stores, and other duty-free finds. 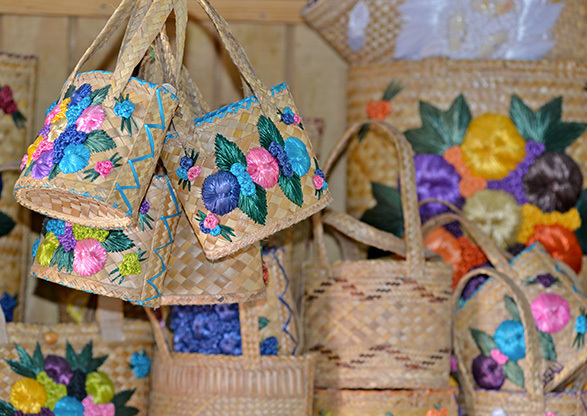 Straw Market – This is your one-stop source for handmade Bahamian crafts, including straw hats, beach bags, conch shell keepsakes and wood carvings. Straw vending is considered one of the country's oldest industries with organized markets in Nassau, Cable Beach, Paradise Island. Remember to bring your bargaining skills. The Cable Beach Pompey Market is a quieter venue if the bustling and world-famous Bay St. location is a little overwhelming. Bahama Hand Prints – If you love the colorful fabrics you see around the resort, don’t miss the Bahama Hand Prints boutique and factory where the tradition of hand screen-printing continues. They feature a unique Bahamian-made line of clothing and accessories. In addition to shopping in the store, you can take a tour of the factory and watch as the prints are created from scratch. John Watling's Distillery - John Watling’s Distillery is the home to JOHN WATLING’S Rum, the “Spirit of The Bahamas”. It is where its namesake rum and other spirits are handcrafted by Bahamian hands, using local materials and employing traditional English rum-making methods. You can tour the distillery, sample the products and make purchases in their store. Bahamas Rum Cake Factory - Sample several scrumptious flavors like Pina Colada, banana, chocolate and plain pound cake. The cakes are marinated in the famous Ole Nassau Rum, distilled in Nassau, New Providence Island. Visit the Bahamas Rum Cake factory daily between the hours of 10:00 a.m. and 5:00 p.m. to experience a tour of the facilities and free tastings. Home-made jellies and jams are also available. 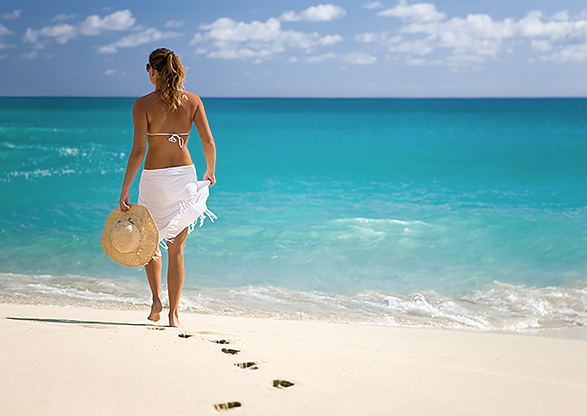 Whether you are looking for Vitamin Sea or D, life’s a beach in The Bahamas. From hammocks to snorkeling to tropical cocktails, we have you covered at our own crystal clear, turquoise resort beach. Check out the variety of beaches at some of our nearby favorites. Cable Beach – This beautiful expansive beach is considered one of the best beaches in the Bahamas and is home to Baha Mar, Melia and Breezes. It can be busy and is a great place if you are looking for water sport activities, hair braiders and souvenir vendors (remember to negotiate). Protected by a barrier reef this fine white sand beach along with our beach can be calmer than those on Paradise Island if the wind picks up from the North. Only minutes away on the #10 Jitney Bus. Most Cable Beach hotels offer day passes if you want to have additional access to their pools and all-inclusive amenities. Cabbage Beach – located on Paradise Island, Cabbage Beach is a two-mile stretch edged by crystal-clear waters and dotted with palm trees. There are hair braiders, souvenir vendors and jet skis for rent (remember to negotiate). This beach can be busy as it is regular stop for cruise ship passengers and is the home of Atlantis, however, walk east along the beach a bit and you can find a quieter area. Take the #10 Jitney Bus to downtown and then the Ferry Boat to Paradise Island. Alternatively, expand your beach day with a day pass to Atlantis including transportation from our resort. Junkanoo Beach – If you are looking for a “Spring Break” type environment head to Junkanoo Beach located downtown. This sometimes crowded and rowdy beach is a good place to party. Please be very careful when operating Jet Skis as there have been a number of fatal accidents. Please be warned that Jet Ski operators do not necessarily carry insurance and are usually not connected with the hotels nearby. If you would like guidance in the best Jet ski operators our concierge team are happy to point you in the right direction. The best off the beaten track beaches: venture west and to the southern shores. The #10 Jitney bus continues west from Sandyport past a number of quiet local beaches that offer caves, historic sites, good snorkeling and even horse back riding. Jaws Beach – This pristine, well-protected beach was the filming site for the final installment of the “Jaws” movies and is about 20 minutes west of Sandyport Beach Resort. This beach is part of the Clifton Heritage park and is protected above and below the water. Pack a picnic as there are no restaurants and plan for a day of family fun in the sun (or abundant shade) and make sure to stop by the Clifton Heritage Center. 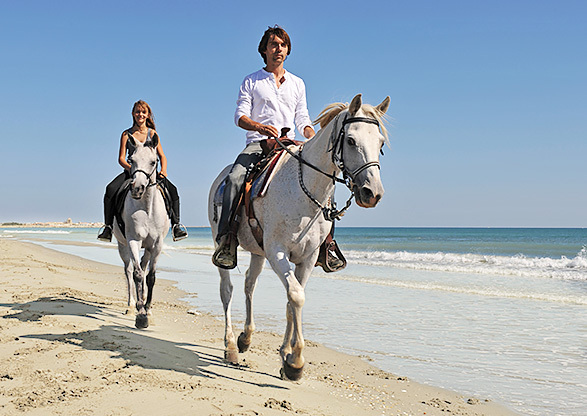 Coral Harbour – Ride a Horse on the beach in Coral Harbour transportation included. Adelaide Beach is not on most tourists' radar. Located on the southside of Nassau within the small village of Adelaide the beach here is long and virtually empty during the week. It wakes up on the weekend as a popular locals’ spot. Venture further afield with a day trip to a private island or visit the pink sands of Harbour Island. Pink Sand beach of Harbour Island – Harbour Island “Briland” is famous for its 3 ½ mile pink sand beach and quaint village of colorful island cottages. Take a day trip with a Bahamas Fast Ferries package including resort pick up and return high-speed ferry service to Harbour Island inclusive of golf cart use. Take a boat trip to Blue Lagoon Island or Rose island and enjoy nearby island beaches only accessible by boat. Have an out island to yourself. Hitch a ride by chartered seaplane to your own piece of idyllic paradise for the day. This is the ultimate engagement trip and definitely bucket list worthy. Relax and focus on your health and wellness at Sandyport Beach Resort. We’ll connect you with the island’s best yoga instructors, massage therapists and personal trainers. Club One Fitness Centre – As a guest of Sandyport Beach Resort, you’ll receive discounted passes to this top-tier facility just steps from the resort. Classes from Yoga to Boot Camp have you covered. Aqua aerobics by Club One takes place in our resort pool (seasonal). Studio Vivo Hair Salon – located in the Sandyport Marina Village. Massages – Allow us to arrange an in-room or outdoor massage with Suzanne Fraser of Tranquility Massage. Spas – our concierge team can assist you with making reservations at many of the top spas on the island. Beautiful ocean views create a perfect backdrop for sports, golf and fitness in the Bahamas. The resort is ideally located near the Thomas A. Robinson National Stadium and the Betth Kenning Aquatic Center and the in room kitchen facilities make sticking to their strict athletes' diets even easier. Where better to sharpen your skills than a tropical paradise? Ready to get started? Club One Fitness Center – is one of the premier fitness facilities located in the Bahamas and is the center of choice for many top Bahamian athletes. Located in the Sandyport Marina Village just steps from the resort. 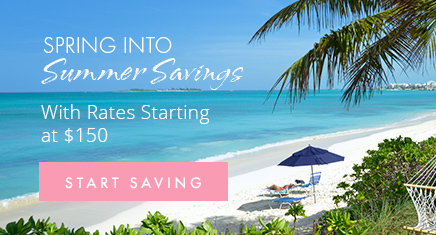 Discounted rates offered to resort guests. Thomas A. Robinson National Stadium - This $30 million, state of the art facility, located in the 450-acre Queen Elizabeth Sports Centre is the center for sporting, cultural and entertainment events and other recreational activities. This 15,000-seat stadium has a natural grass field for American football and soccer, an IAAF-certified track surface press center and media center Recent events include IAAF World Relays, Popeyes Bowl, and International competitions. Betty Kenning Aquatic Center - The Betty Kelly-Kenning National Swim Complex, adjacent to the Thomas A. Robinson National Stadium is Olympic, international and CARIFTA certified. Recent events include the CARIFTA Games and the National Swimming Championships and it serves as the winter training site for many international universities and Olympic hopefuls. Marathon Bahamas – Held every January in Nassau, this popular race weekend draws top runners, thanks to a scenic oceanfront route and post-race fun.